Two things should be remembered about the arrival of the Chicago, Milwaukee and St. Paul Railway through the southern part of Crawford County in 1882. First, railroads were the only inexpensive, effective way of shipping out grain and livestock, and of hauling in lumber, food, and other merchandise. Second, four major rail lines had crossed Iowa 25 years earlier, bringing rail service as close as Westside and Vail but still leaving this area somewhat of a "no man's land." Twelve miles of rolling, fenceless prairie, dotted with a handful of farmsteads, separated what was to become Aspinwall from "civilization." Westside and Vail in the early 1870s. Many were veterans of the Civil War; others were foreign farmers. The first land to be purchased was that closest to the rail line, but as that land became more and more expensive, the new arrivals branched out farther and farther from the established settlements. Land was cheap, plentiful, and, according to those first brave residents, quite fertile. uncle or brother who had arrived earlier. Once here, a young man could earn his own stake in the mines, sawmills, lumber yards, and fields of eastern Iowa. Many times, a spring wedding with a young woman from the "homeland" would be followed by a departure to the farmland purchased in western Iowa sight unseen. Some new brides accompanied their husbands -and the cattle, hogs, cooking utensils, handful of farm tools, and a few sticks of furniture to help create a home and break the prairie; others would wait for months to be "sent for," then ride the long miles west alone, wondering all the while if the husband had received the letter announcing the arrival time and would be waiting at the depot. 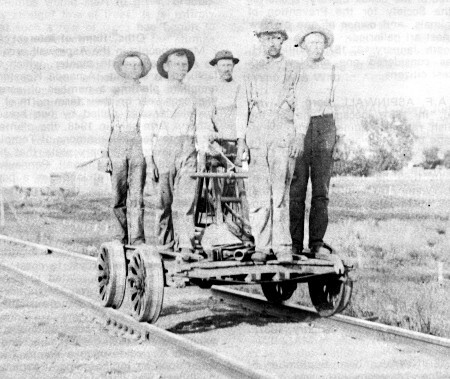 Harry Hays, second from left, and other Aspinwall section crew members roll leisurely along in their handcar in the years before 1902. The building in the background is unidentified. 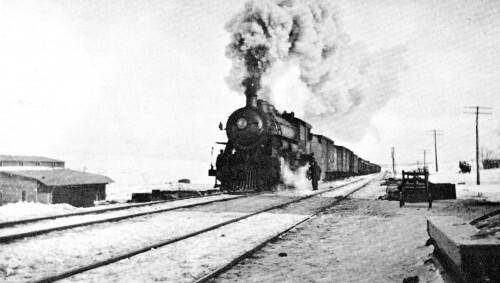 Steam-powered Milwaukee freight trains, such as this one arriving in April, 1916, were once a familiar scene from the Aspinwall Depot. At the left in the picture is the lumber yard. From 1871, when Marcus Kuhl arrived as "one of the first two or three settlers in all of Iowa Township," until 1881, when the Milwaukee planned its new track across Iowa, this area had grown tremendously. And where the companies building rail lines in 1866 had been given land by the state to help pay for the construction of the tracks, the Milwaukee and other lines building in the 1880s had to buy their right-of-way rights from the new farm owners. Today in Chicago, the Milwaukee's offices continue to keep on file the volumes of documents granting permission from landowners to build tracks on their land. In most cases, the permission was given gladly and for sums ranging from $10 to $200. These records show several interesting things. One is the speed in which the transactions and construction took place. Papers were signed in July, 1881, selling the right-of-ways to the railroad; the 260 miles of track from Marion (near Cedar Rapids) to Council Bluffs were laid within a year, and the trains were running by the end of 1882. Although there is no evidence of settlers in this area before the early 1870s, most of the documents show a number of land transactions starting in about 1860. For instance, the 40 acres in the southeast quarter of the northwest quarter of section 14 of Iowa Township -- now part of the Roland Meeves farm east of Aspinwall shows the following landowners, beginning September 1, 1860, and ending October 5, 1880: Albert L. Mowry, William A. Compton, Lucien Rust, Alexander Culbertson, Harvey and Amanda Bechtil, and F.M. Offineer and wife. Who were these landowners? Did they actually farm the ground, or were they absentee owners, possibly representing a land company or buying the property for speculation? Most of the right-of-ways were transferred to the Milwaukee with apparently no problem, but at least one resulted in a condemnation suit. A six-member board of commissioners was appointed by the Crawford County Sheriff and sent out from Denison, as the landowners had refused to grant portions of their land for the right-of-way. The "damages" were appraised at $75. The railroad thus purchased a 100 foot strip through the southwest quarter of section 15: Aspinwall. Neither the railroad files nor old newspaper clippings have revealed the reasons for choosing the location or the name for the town called Aspinwall. It is probably safe to say that railroad officials determined the location, both as a central trading point and because the steam-powered trains needed to "take-on" water and coal every few miles. John Gluckstadt is now brakeman on the line of the CM&SP Railroad between Council Bluffs and Perry.